It is necessary to know or measure the power consumption of your devices and appliances before an alternative energy system is put in place. You need to understand the energy requirements. Are considering or planning an off-grid or standalone alternative energy system such as a solar PV system? Maybe for your home, your cabin or wherever else? Maybe just a source of backup power for a few things? One of the first things you need to do is to check the energy usage or power consumption of the appliances and devices that you intend to use. I have been using one particular convenient power meter for this purpose. A few years ago it really helped me during the design stage of my current PV solar array size, battery bank, charger/inverter, etc.. I have a background in electronics, electricity, and electro-mechanical. But you don’t need to be an expert to grasp some of the basic concepts of a solar PV system. Though you do need some fundamental knowledge of electricity – such as ‘ohms-law’ and a few other fundamentals). My assumption for this article will be that you have some basic knowledge. Even if you don’t posses some of the fundamental knowledge in this area, hopefully you will still find the articles to be somewhat interesting (grin). The goal here is to supply enough alternative energy to power some devices. Maybe lights, a refrigerator, chest freezer, furnace, or any other electrically powered appliance or device. Each and every appliance or device requires (draws / consumes) it’s own unique amount of power to function. Power is the rate of doing ‘work’. Some devices draw a constant and same amount of power. Other devices or appliances will vary their consumption over time. For example a refrigerator will cycle its compressor pump on and off throughout the day. In the United States, when you ‘plug a device into a wall outlet, it’s ‘fed’ 120 volts of electricity. As the appliance or device draws power from that 120 volt line, it draws ‘current’ (measured in ‘Amps’). You might picture ‘current’ as the water flowing through a garden hose. The water pressure of that hose is analogous to ‘volts’. Calculate the power that the appliance uses by simply multiplying ‘Volts’ times ‘Amps’. Power is measured in ‘Watts‘. 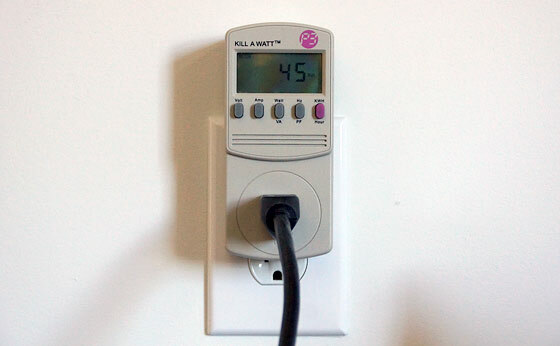 Okay, let’s make it even easier to figure out how much power your appliances draw. It’s called the KILL A WATT meter. And even more useful, kilowatt hours! What’s kilowatt hours? It’s the ‘watts’ used over time (kWh). Knowing the kilowatt hour consumption of an appliance (over time) is an accurate way to know the ‘real’ power consumption (as opposed to instantaneous consumption which may vary). While the power of some devices will remain the same (a light bulb will always use the same power over time), there are some devices which vary. And the only real way to know how much power the device uses is to measure it over time. To get a longer term ‘average’. This is very important for some aspects of design. For example, Lets say that I want to discover the real power consumption of my refrigerator. I know that if I plugged the refrigerator into the KILL A WATT meter and measured the instantaneous power consumption – I knew that it would not be accurate. Why? Because I know that a refrigerator compressor will cycle on and off throughout the day. So the only accurate way to measure it is to leave it plugged in to the Kill-A-Watt meter for say, 24 hours. 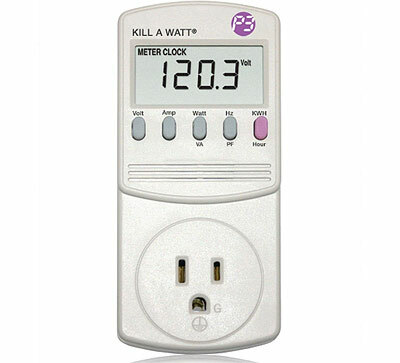 The meter will then ‘accumulate’ the watt hours used and will display the running total! In my particular case, I left the fridge plugged into the meter for 24 hours. The meter indicated that it had consumed 1.36 kWh of electricity. That’s 1,360 watts over 24 hours. By simply dividing 1,360 by 24, I knew that my refrigerator draws 57 watts of power on average. Tip: The ‘turn on’ spike current of some devices is another important parameter for design consideration (the inverter). But that’s beyond the scope of this article. I did the same for my chest freezer. Measured it with my Kill-A-Watt meter. The freezer was already at temperature and filled. After 24 hours it had consumed (only) 0.264 kWh (or 264 watt hours) which comes out to be just 11 watts per hour on average! Less than I thought it would be… (though it’s a good chest freezer). You get the idea – you simply plug in various devices and measure them over time to get an accurate averaged measurement. This can then be used in one’s calculations of ‘real’ power requirements for the devices for your alternative energy system. I even measured the power consumption of my furnace. During the peak of winter when my propane-fired furnace was operating the most (it also is used for my hot water), I wanted to know what the ‘worst case’ scenario would be with regards to the power consumption. I constructed a set of ‘pig tails’ from having cut a short heavy duty (#12) extension cord in half (don’t try this at home unless you are qualified!). Then I connected this into my circuit-breaker panel to temporarily re-route my furnace ‘hot’ and ‘neutral’ line through the KILL A WATT meter. I thought I would share with you the methodology I’ve used for calculating power consumption here at home. I used the data to build a spreadsheet. It helped while deciding upon efficiencies, system integration, etc. While my electric utility bill provides an overall energy consumption for a given month (total kWh), it helps immensely to understand the individual energy demands of each device and appliance. I literally measured everything that uses electricity in the house! The solar PV system that I designed does not replace my existing 200 Amp electrical service. But instead it’s integrated as an off-grid standalone source of energy which I selectively switch in (or out) by way of transfer switches. Really comes in handy at times. Also, if I remember right Ken, you use 2-way breakers in your panel rather than an ATS for power-down situations, correct? Right. I don’t have an automatic setup. They’re manual. A couple of “Pro/Tran 2” transfer switch boxes made by Reliance Controls. Wondering, is that a Strobe at top right of House Panel? That device is a panel surge protector from midnitesolar. They make a variety of types. I also have them across my solar panel inputs, and the DC side of my inverter and charger. Just in case. Regarding my manual transfer switches and my solar system at large, it requires me to stay aware of my battery bank state-of-charge and other factors (weather – sunlight), season, load balancing. If I were to ever sell the place, if the next owner doesn’t have a clue about this stuff, it would not be as valuable to them. Though if it were ‘fool proof’ (automatic switching back to grid when the battery bank gets too low), that may be of benefit. I may still look into integrating that, while still keeping my transfer switches for overall load balancing. There I go… adding on another project for myself. I know enough about Solar probably to get me into trouble at times. I do like the idea of the Surge Protectors on the equipment, but from what I know of Lightning (a LOT more than I ever wanted to know), no surge protector in the world will help much, with that said they sure do help in Grid Power surges and spikes. Here in the SW our power is some of the dirtiest in the Grid, most of the time if we get hit with a good one (spike), tis time for new Computer Equipment and just forget the cost of S-Ps waste of $$$. Seriously that bad, I’m talking standard voltage of 110 spiking to well over 140 at times. I need to get one of these meters. I did it the old fashioned way, and relied on the power usage info on the appliances. I’m sure the meter would provide an accurate number, compared to “ideal” situations for advertising appliances. Is the meter, user friendly? It looks to be menu driven. Might be fun to check many, even tiny, devices over a period of time. Undoubtedly, better than a multi-meter. A very neat looking install of your power. Good job! I guess I’m old-fashioned, but I too like manual switches. I just feel better about them. Kinda goofy, oh well, so am I. Yes, the meter is user friendly. Just plug it into an outlet, then plug your appliance or device into it. The buttons on the front will simply display the various parameters. PSA: this is the last year to qualify for the 30% federal subsidy for a solar system. If you were ever thinking about getting into solar this is the year to get it. You can almost get 1/3 of your solar system paid for. Quick question for you on this. Are these discounts allowed for self- installed systems? if I remember correctly, when I last looked, it was really slanted towards having the systems installed by “a professional solar contractor”. Some of us are able to install our own systems, would be nice if we could get the same credits. Last I read it was for “any” system, BUT you have to have all receipts and cost detailed. One can also take the cost of electrical work done and so on. But remember this is a one time tax cut, you can’t keep adding and adding and expect more tax cuts. My brother has purchased one of these items, recently. Not sure if it’s the same make, but I think so. It’s amazing how much energy a refrigerator draws, even a sump pump, coffee maker. He can now tell you how much his sump draws, how many inches of basement water has been dispersed within a months time, etc. Wayyy too much information, for me. I’m just trying to cope, with the everyday normals. When I get time, I’ll ‘borrow’ it from him. One needs to remember this particular meter is for 110-120 volt only, not for 220V appliances. The Kill-A-Watt is also useful for finding “stealth” energy wasters. I bought mine in 2003. I had a HP laptop, and a 36″ CRT TV. That damned laptop used more energy than a 36″ CRT TV!!! You’d be surprised at what is… and isn’t sucking you dry!